Bay Laurel (Laurus nobilis): growing, planting, caring. 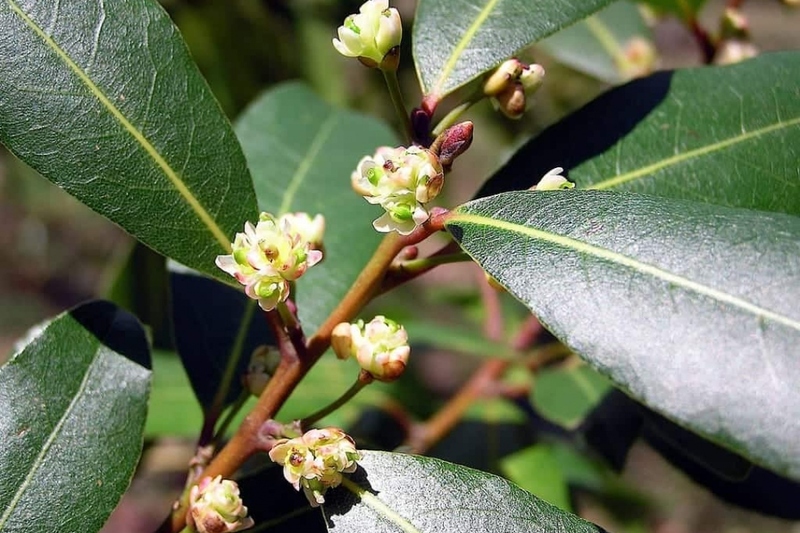 The bay laurel (Laurus nobilis) is sometimes called "sweet bay" because its leaves are used in the bouquet garni. Be sure to never confused it with oleander (Nerium oleander), or with cherry laurel (Prunus laurocerasus), which are both toxic! Laurel is a plant of Mediterranean origin, who prefers the open soil, is hardy to zone 8 (therefore, not suited for the mountains or most of western and southern England), and can withstand temperatures as low as -10°C. You'll see it thrive in sunny spots, planted deep in well-drained soil rich in humus. Hang around for a few years and you can watch it grow into a little tree as tall as 10 meters. Container gardening is possible provided you don't mind restricting its growth in terms of size. A small fragrant tree between 2 and 10 m tall, with spear-shaped evergreen foliage, alternating on raised stems. White flowers in fragrant umbels. It's the real laurel of Greeks and Romans, which was used to make crowns. - Plant before or after frost in a soil rich in humus, deep and well drained, in the sun. Plan for the plant's development of up to 3 m on each side, dig a hole two times bigger than the root ball, plant without buying the root collar, form a basin for watering. - If potted or trayed, plan to use a container that has a diameter of at least 50 cm, add gravel to the bottom covered in landscape fabric to facilitate draining, and plant in a mix of potting soil and garden soil. The bay laurel decently handles pruning. The only concern is to limit its development and conserve a very compact habit. This is thus not useful unless you have a limited space or want to rebalance its silhouette, but you can cut the branches' ends each year at the beginning of spring. Cut dead branches or those that cross. - In the first month and in case of drought, water abundantly but not too frequently, so that the roots will fetch water deeper. Water thoroughly, until the soil is wet and a small puddle remains around the tree. - In pots, water every 7-10 days on average, a little more often in case of drought. Mulch each year with a wood and leave based mulch/soil enricher. This will keep the soil rich in humus and will limit the need for watering and weeding. Ideally, you should replace some of your laurel's soil from time to time, either by repotting it in a bigger pot, or by changing at least the top soil. Otherwise, add an organic soil enricher each year. Bring potted laurels into a unheated shelter in October if you are in a region with harsh winters. Remind me before the frosts. Bring out potted laurels in April. Place them in light.